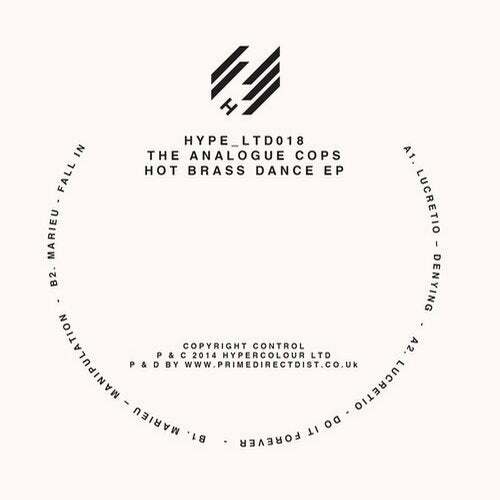 Returning to HypeLTD after only a few short months, The Analogue Cops seem the perfect artist pairing for the label, carving out an unashamed love of raw, pummeling, dirty house grooves and choice samples. 2013s iIn Plain Clothesi EP was passionately received by many, and the Italian team are back for more with the iHot Brass Dancei EPO. Lucretio takes up the A side honors, and on iDenyingi we get that familiar marriage of crusty and crunchy drum beats and a ehands in the air piano/vox sample, the 909 rides pierce through the mix whilst the distortion levels cook, but never burn. iDo It Foreveri treads similar turf, all pumped up Relief Records drums, sweet vox and a trance inducing synth arpeggio. On the flip, Marieu takes up the mantle, and theres no relent on the drum machine/sample combo. No doubt finding influences in the rough and ready Dance Mania releases of the 90s, Marieu weaves these components and more, throwing in some batshit crazy acid licks and industrial sized breakbeats on iFall Ini, subtlety left firmly at the door whilst the machines batter out another solid but uncompromising track.